There is some confusion—even among acupuncturists—over just how old acupuncture really is. To understand the origins of acupuncture, we must see the difference between using the nearest sharp object to poke people where it hurts, and practicing acupuncture based on an organized medical system. Though the theory and principles that guide modern practice were written down about 2,000 years ago, some claim that acupuncture is even older. In terms of Chinese medical history, “2000 years ago” refers to the years between 200 BCE and 200 CE, give or take. But for our purposes, we may say that Year Zero marks the boundary between the practice of shamanism and the systematic practice of acupuncture. That 2,000-year mark is solid—sinologists and Chinese medicine scholars agree. What it marks is the systematization of acupuncture and herbal therapy. This means that natural science was applied in order to formulate a rational understanding of health, disease and treatment. Pre-Year Zero, the Chinese thought malevolent spirits caused disease. So, they would do things like chant and burn incense to scare the evil spirits away—maybe not unlike a few acupuncturists today. But let’s call those folks, romantic outliers. Year Zero, the Chinese discovered that the environment—both external and internal—caused disease. The external environment refers to the six climatic factors: wind, cold, damp, heat, dryness, and “summer heat” (a mixture of heat and dampness). The internal environment refers to our emotions, and the food and drink we take in. Then there are “miscellaneous” causes of disease, like trauma and toxins. Acupuncture strengthens the body and restores normal function so that we are less susceptible–or are able to counter–the causes of disease. This basic treatment principle is based on a system that was established no more than 2,000 years ago (+/- 200). However, some say that acupuncture is 4,000—even 5,000!—years old. One source of this misconception is the title of the 2,000-year-old medical text that is the framework for acupuncture practice, the Huang Di Nei Jing (Yellow Emperor’s Internal Classic). The Yellow Emperor is a legendary figure. Though he is considered the progenitor of Chinese civilization, reigning from 2696 to 2598 BCE, his historical existence is questioned by scholars. That his name graces the Chinese medical canon is not a reason to date the text at 4,700 years old. Lo, in her introduction to Lu and Needham (2002), states that attributing works to cultural icons added authority to the writing of that time. Veith (2002) suggests that such name-dropping can signify reverence for a text. Another route to misinformation is a failure to check sources, or to mash them up. For example, do a Google search on “acupuncture tortoise shell inscription.” It will return a number of sites that say something about the first written record of acupuncture being in the form of hieroglyphs on Shang dynasty (1500-1000 BCE) bones and tortoise shells. The early tools of acupuncture were crude. They were pointy stones, or macabre-looking bronze surgical implements. There may have been less chanting 2000 years ago, but healers were still cutting or lancing rather than doing any procedure that resembles modern acupuncture. For during the early stage of acupuncture development, therapeutic piercing or pricking most likely resembled bloodletting (Yang & Wilms, 2010). A firmer grasp of acupuncture history requires a distinction between the fundamentals of practice and the methods of needling. Though the bloodletting–as mentioned above–preceded the use of fine needles like the ones used today, it was still based on the same principles that guide modern acupuncture. 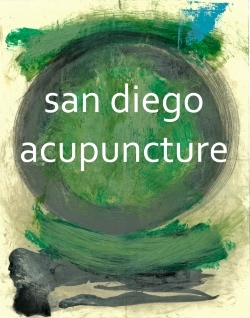 It marks the early development of acupuncture, and there have been further milestones since then. I don’t mean to gloss over 2,000 years of rich medical history, but my point is that acupuncture is not 4,000-5,000 years old. But it is technically 2,000 years old. So how old is old? 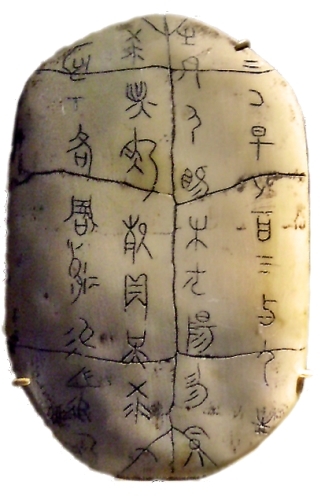 (1) According to the image source, this is a picture of a replica of an ancient Chinese tortoise shell with inscriptions. It may, or may not, say something about obstetrics. I simply used it here for thematic effect. (2) It is possible that pre-historic Chinese used crude needling practices (e.g. tattooing) to treat musculoskeletal pain. But it was a much less organized system of healing, and not unlike other pre-historic cultures. See http://aim.bmj.com/content/31/1/2.full, and http://www.iceman.it/en/node/262. Maciocia, G. (1998). History of gynecology in Chinese medicine.Obstetrics and gynecology in Chinese medicine (p. 3). New York: Churchill Livingstone. Ming, Z. (2005). The medical classic of yellow emperor. Beijing: Foreign Language Press. Unschuld, P. U. (2003). Huang Di nei jing su wen: nature, knowledge, imagery in an ancient Chinese medical text, with an appendix, the doctrine of the five periods and six qi in the Huang Di nei jing su wen. Berkeley: University of California Press. Veith, I. (2002). Huang ti nei ching su wên = The Yellow Emperor’s classic of internal medicine. Berkeley: University of California Press. Wu, J. (1993). Ling shu, or the spiritual pivot. Washington, D.C.: Taoist Center. Yang, J., & Wilms, S. (2010). Yáng Jìzhōu’s the great compendium of acupuncture and moxibustion: Zhēn jiŭ dà chéng. Portland, Or. : Chinese Medicine Database.